The Corner Bakery Cafe, located at 2326 W. Brandon Blvd. in the Regency Square Mall, made its Brandon debut on Saturday, January 18 with a preview party. Invited guests were treated to breakfast, lunch or dinner with all donations going to the Emergency Care Help Organization (ECHO) of Brandon, a local emergency food and clothing pantry. Over 1,200 people visited the Corner Bakery Cafe resulting in a donation of over $2,000 to ECHO. The Corner Bakery Cafe officially opened on Monday, January 20. The first 100 guests received commemorative travel mugs and free daily refills of coffee for one year. They will also hold a drawing on Saturday, February 22 where one lucky person will receive a free panini for a year. This is the first location of the Corner Bakery Cafe in the Tampa Bay area. Karen Armando Cohen and his group, CB Restaurant Holdings, LLC is the owner operator of the Corner Cafe Bakery. Cohen said, “We like to become a part of the community where we do business.” This is the reason ECHO was chosen for the preview party. 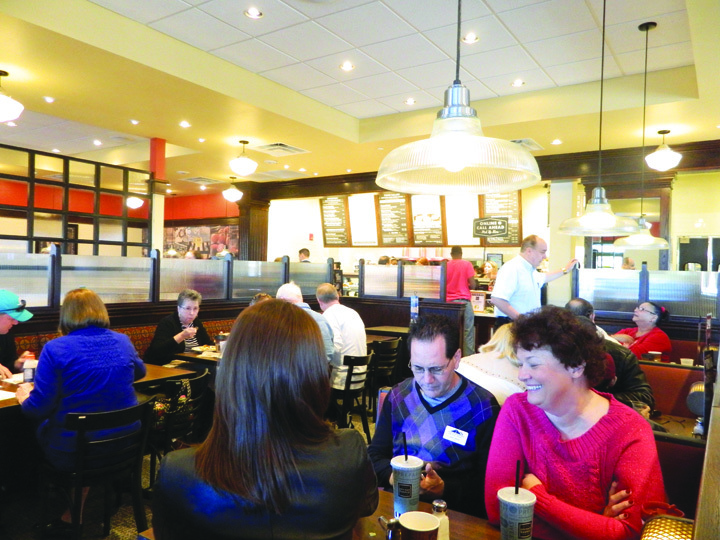 In addition, the Corner Bakery Cafe has become a member of the Brandon Chamber of Commerce. They will be a part of the upcoming Taste of Brandon Expo and will hold spirit nights which support local schools. Corner Bakery Cafe is a fast casual restaurant serving breakfast, lunch and dinner seven days a week. “Everything is fresh. We bake five times a day so all of our breads, signature cream cakes and sweet crisps are always fresh,” said Cohen. They have a full kitchen. Everything is prepared when you order it. Servers bring you your meal and bus your table when you are finished. “Our servers will help you get whatever you need,” added Cohen. They offer a wide menu with something for everyone. Baked goods change with the holidays plus they offer catering. There is a $50 minimum charge for delivery of catering. They also offer online and call ahead to-go orders. Corner Bakery Cafe will be open Monday-Friday from 6:30 a.m.-9 p.m., Saturday from 7 a.m.-9 p.m. and Sunday from 7 a.m.-8 p.m. For more information, please visit www.cornerbakerycafe.com or call 982-3073.